Sometimes solar heat gain can be referred to as passive solar gain by people, it is the same thing. However, it is different to utilising solar energy with solar panel installations. Have you ever been stood in a room with windows that are uncovered and the room is quite hot, without even using the heating system, and yet it is fairly cold outside? Or how about being in a room with windows, but covered by curtains, when it is really hot outside, but it is nice and cool inside? This is all to do with the principle of Solar Gain. Solar Gain is where solar radiation (ie the rays from the sun) helps to increase the temperature in a space, object or structure. Basically when the sun is shining it will heat objects. Depending on the types of material that the solar radiation is meeting, then it will pass the heat through to a greater or lesser degree. A window, being made of glass which transmits heat very quickly, will allow the heat to pass through with little obstruction. A wall, being thicker and made of a different more dense material, will slow the transmission of heat. So if a building has a lot of windows then the rooms within the building will be subject to greater heat changes due to Solar Gain. Well, used sensibly, the heat gain from Solar Gain can help to raise temperatures within a room during the colder periods. For example during a sunny winter’s day, leaving the curtains open might help to actually raise the temperature in certain rooms thus reducing the reliance on the main heating system during the day thus saving you money! 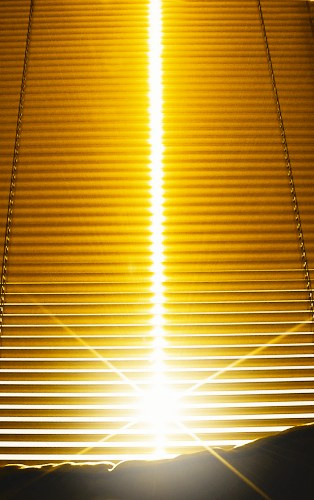 Equally, during the hot days, drawing curtains over will help to actually reduce the impact of solar gain into a room and help to keep the room a comfortable temperature. This is called helping to maximise Solar Gain by using items such as curtains and blinds which can help you to have some control over the Solar Gain in an area. Honestly, with the British climate relying on the sun can be tricky. For example, during the winter, if you were to leave the curtains open in the expectation that the sun will shine all day, but it is cold, cloudy and snowing, then the benefits from Solar Gain would be lost. Controlling Solar Gain properly will rely on prompt user interaction and keeping an eye on the level of the sun outside. Implemented correctly these methods help to not only keep your property cooler in the summer, but also warmer in the winter. Not to mention the presence of curtains and blinds will actually help to reduce draughts and keep heat inside the property during the colder periods. All in all this is a very sensible and very inexpensive way of helping to keep your property at a comfortable temperature all year around!